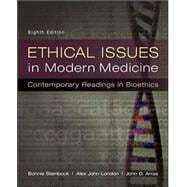 Ethical Issues in Modern Medicine: Contemporary Readings in Bioethics, Eighth Edition, is a comprehensive, state-of-the-art anthology that covers both traditional and emerging issues in the field of biomedical ethics. Engaging case studies preface longer, reflective papers written by leading scholars. Each of the book's seven parts begins with a helpful introduction that raises important questions and skillfully contextualizes the positions and key points of the articles that follow. This eighth edition has been thoroughly updated to include the most important recent contributions to contemporary debates, and all selections have been subjected to the editors' exacting standards for both scholarly quality and teachability. Case Study: Beneficience Today, or Autonomy (Maybe) Tomorrow? Personal Statement of Edmund D. Pellegrino, M.D.